Clearwater, FL., November 11, 2017 – The injury bug can be devastating for any team hoping to win a national championship and that’s exactly what the South Atlanta Twins got an experience of in Saturday’s 45+ American title game versus the New Jersey Pirates. With less than 16 players and tired legs in the infield, the Twins were no match for the juggernaut Pirates, whom piled up a total of 30 runs on the day en route to defeating South Atlanta 13-0 in seven innings. 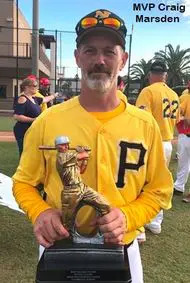 The tournament’s Most Valuable Player was New Jersey pitcher Craig Marsden, who was a late add on for the Pirates before the tourney began. From the outset, many could see that the Twins were outmanned and numbers were low, as Marsden made quick work in the top of the first inning. The right-hander allowed one hit and got out of the top of the frame only facing four batters. It would be a much different story for the Twins in the bottom half of the inning, as South Atlanta yielded two runs off three hits and a couple errors in which became a sign of things to come. It ended up being a disastrous bottom of the third inning that decided the fate of the contest, as the Pirates piled up nine runs in the frame and exited with an 11-0 advantage. New Jersey was able to take advantage of five walks and four hits en route to scoring the nine runs. Armed with another large lead like they’ve had for most of the tournament, Marsden and crew made sure to keep the door closed shut and allow not such comeback attempt by the Twins. Marsden completed the game and allowed only six hits and struck out three batters. For the Twins it’s another disappointing finish, despite reaching the championship game. South Atlanta Twins manager Ken Lorow said after the game that injuries to the infield remained a key factor down the stretch and he hoped in the future the team could have a few more reserves in place.